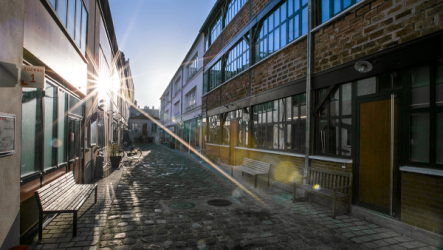 Smart Food Paris is a dedicated space, geared to growing your company. It fosters emulation and multiplies opportunities for meetings with other startups, key partners in your business sector and innovation ecosystem players. 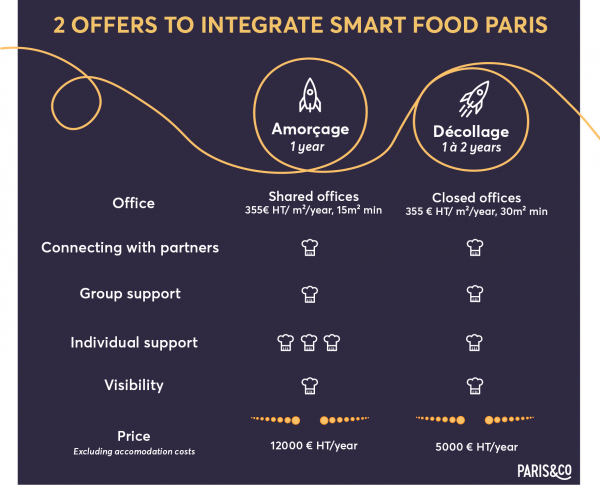 More than a simple business incubator, Smart Food Paris combines key food industry players (large companies, institutional partners, experts and start-ups, etc.). 40 start-up companies incubated since 2016 and more than 300 start-ups incubated by Paris&Co in 2017. Take advantage of non-equity, tailored support measures, based on public funding (BPI). Enjoy a privileged relationship with our founding members and develop business partnerships : Bel, Blanco Professional, Carrefour, Elior Group, Pomona, Honest et Tetra Pak. Smart Food Paris now has a culinary laboratory, the Smart Food Lab. This professional kitchen is associated with a tasting room, allowing startups to experiment their innovative recipes in situ! To get more information, visit the dedicated page. NB : Quoted accommodation costs exclude internet, telephone and electricity. Are you launching or in the process of creating your start-up business? Are you looking for your first customers? How can you acheive this goal? - A turnkey venue located at 80 Rue Haies in the 20th Arrondissement. Our business is to support you, not fund you. We don't buy shares in your company. The cost of the Amorçage programme is 12,000 euros per year (excl. VAT, and accommodation costs). You are an advanced start-up company? You are looking to accelerate your growth and conquer new markets? Expand on the international stage. How can you acheive this goal? ? - Test your innovative solution under real conditions. - Your international development strategy. The cost of the "Décollage" programme is 5,000 euros per year (excl. VAT, and accommodation costs). Startups in the growth stage that don't need premises can, with a special exemption, join our incubator programme as an external beneficiary, with access to events and networking arranged for incubator start-ups. Smart Food Paris team is your single point of contact. The team is there, on-site, every day, to challenge you in your business dealings, connect you to the ecosystem, create synergies and exchange good practice with other start-ups selected to join the platform. It will provide you with a synchronised and tailored support programme that combines individual monitoring, collective intelligence and connection to the ecosystem, in three main formats: Incubation Board, Inter-Start-Up Workshop and Office Hours.